*He's already begun the recruiting process of free-agent center Dwight Howard, recently calling the Lakers' big man. 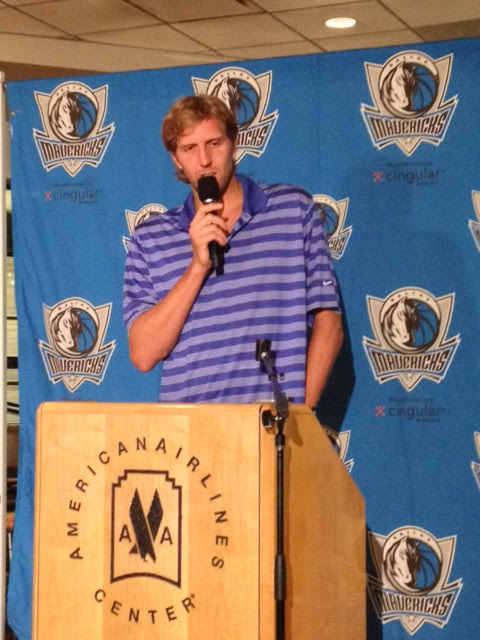 "I reached out to him," Dirk says, "Told him that we'd love to have him. ... And if I need to jump on a plane, I'm free. I'm available." *He'll be in the team's "war room" tonight alongside owner Mark Cuban, general manager Donnie Nelson and assistant GM Keith Grant. And, for what it's worth, Dirk is intrigued by a potential future in Dallas' front office. "It's something I've always wanted to see how it's done," Dirk says. "Maybe I'll be more involved in that area when I'm done playing." *As for his eye for talent and his assessment of the Mavs' needs tonight, pretty spot on if you ask me: "We need help left and right. I mean, we need a shooter, some bigs. We need a lot of help." Dirk look refreshed. Ready to hop on a plane and go recruit. Yet not at all prepared to concede his career, even at 35, is winding down. "Patience is tough at my age," he says. "I hope I can play at a high level a couple more years and then who knows? I'm not sure where my post-playing days will take me. I'm not sure I'm made for TV. I have a face for radio. Me and (ESPN Mavs' radio play-by-play voice Chuck) Cooperstein." I'd like to think he can help. Still feeling very cynical.